Boericke & Tafel - Insect Gel - 2.75 Oz. Ssssting Stop - Temporary Relief of itch, pain, and redness of non-poisonous insect bites and stings-mosquitos, bees, wasps, etc. Soothes fever blisters & cold sores. 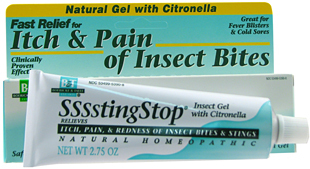 SssstingStop Insect Gel is a homeopathic topical formulation to help relieve itching, pain and redness resulting from insect bites and stings. Clinically tested, proven effective! The London School of Hygiene and Tropical Medicine conducted two double-blinded clinical studies using mosquito's which had not been fed for 24 hours and human volunteers. The test prove conclusively that the medicines in StingStop provide dependable, effective relief. Safe for you and your family! StingStop combines three natural homeopathic (HPUS) medicines prepared from botanical sources. Temporary relief of itch, pain, and redness of non-poisonous insect bites and stings-mosquito's, bees, wasps, etc. Soothes fever blister & cold sores. Other Ingredients: Citronella Oil & Eucalyptus Oil in Water Gel Base. Does Not Contain: Hydrocortisone or other steroids, antihistamines, "-caine" pain killers, synthetic medicines of any kind. For adults & children 2 years & older: apply to affected skin area. Repeat as needed. Children under 2 consult a doctor.